1 of 13. Police officers from Cobb County Police, and Marietta and Kennesaw departments stage near the entrance of the Federal Express Ground building after a man opened fire inside the building before turning the gun on himself in Kennesaw, Georgia, April 29, 2014. According to the official narrative now disseminated by the establishment media, James Holmes was acting out some warped fantasy about Batman when he entered a theater in Colorado and killed a dozen people. It is said the cops found Batman paraphernalia in his apartment, which was supposedly booby-trapped with sophisticated explosives. 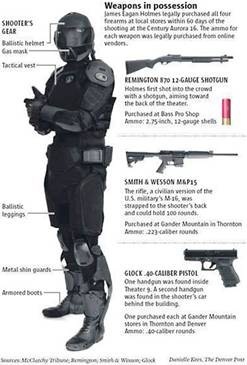 The corporate media has described in detail the gear he allegedly wore during the mass shooting without drawing the obvious conclusion. Instead of a Batman fetish, Holmes was fascinated with the sort of paramilitary gear now routinely donned by cops. Following the September 22, 2011 testimony before the U.S. Senate by Admiral Mike Mullen, that Pakistan’s Inter-Services Intelligence (ISI) supported the Taliban’s Haqqani Network to carry out the recent terror attack on the U.S. Embassy in Kabul, Saudi and Chinese intelligence officials visited Islamabad in a move aimed at assuring the ISI of their support against the United States. After Mullen’s statement, Pakistan fears that the U.S. troops could move into the Pakistani tribal district of North Waziristan, which is the main hideout of the Haqqani Network of the Taliban. As per Pakistani media reports, Pakistani military commanders have rebuffed the U.S. allegations; the Haqqani Network has warned the U.S. against a likely attack on North Waziristan; the Islamic clerics in Pakistan have called for jihad against the U.S.; and now the Chinese and Saudi intelligence agencies are coordinating with the ISI of Pakistan for a possible alliance aimed at a feared U.S. move against the Haqqani Network. 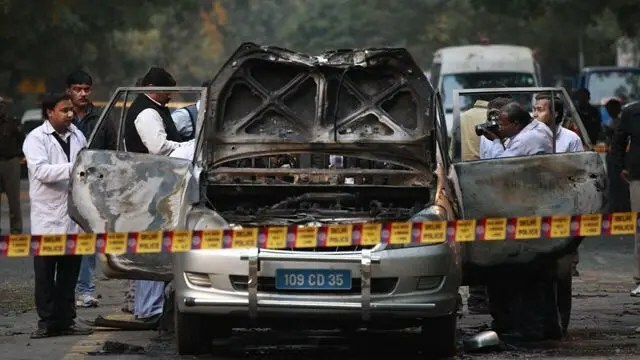 Amid the U.S.-Pakistan crisis, Saudi and Chinese intelligence officials arrived in Pakistan to hold talks with the ISI in a move aimed at countering the U.S. pressure on Pakistan. 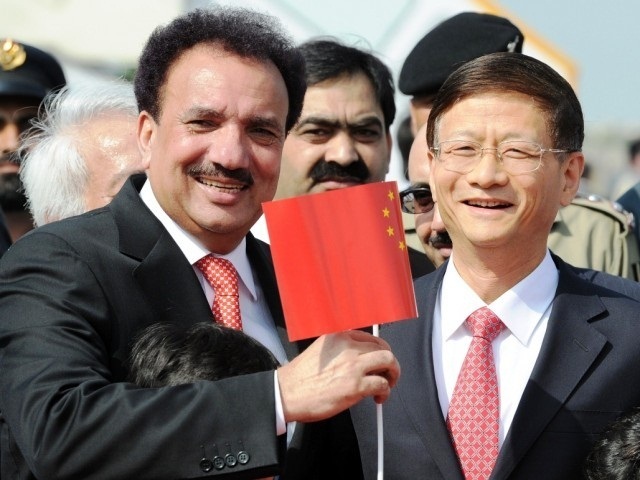 Also on September 26, 2011, Chinese Deputy Prime Minister Meng Jianzhou arrived in Islamabad on a two-day visit, in view of the mounting U.S. pressure on Pakistan. “The visit (by the Chinese leader) has a symbolic as well as substantial value … it will definitely send a message across the Atlantic,” an official at the Pakistani foreign ministry was quoted as saying. Pakistani Interior Minister Rehman Malik and Pakistani Foreign Minister Hina Rabbani Khar issued strong statements against the U.S. for its allegations that the ISI had a role in supporting the Haqqani Network’s attacks on U.S. soldiers and assets in Afghanistan. “But that was then [in the 1980s]. Now, Pakistan has no links with the Haqqani Network which is not based here… They were sons of the Afghan soil and they were based there as well,” the Pakistani interior minister said. 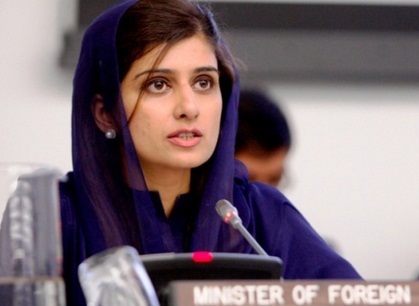 Hina Rabbani Khar, who was asked by the Pakistani government to return to Pakistan from the United Nations in New York amid the deepening Pakistan-U.S. row over the ISI’s support to the Haqqani Network, also blasted the U.S. for the charge. 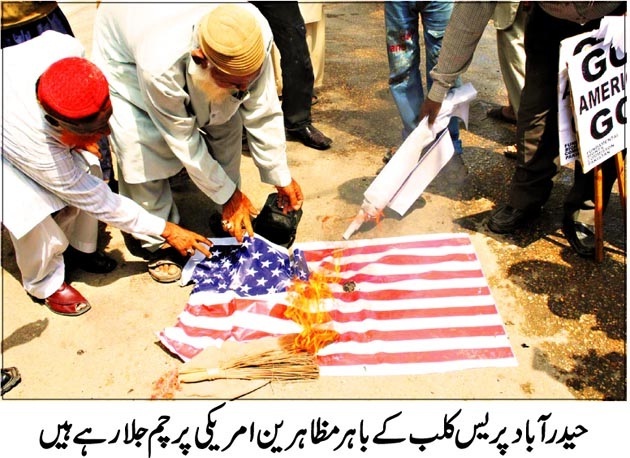 On September 23, 2011, Pakistan Army Chief General Ashfaq Pervez Kayani responded to the U.S. accusation that the Inter-Services Intelligence (ISI) agency was responsible for the attack on the U.S. Embassy. 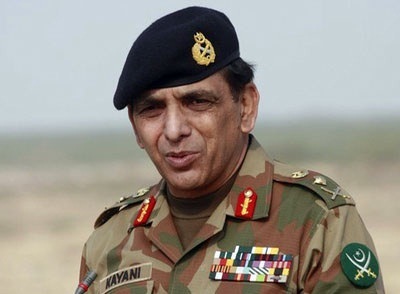 “Rawalpindi-September 23, 2011: While taking note of the recent statements made by Admiral Mullen, Chairman Joint Chief of Staff United States, Chief of [Pakistan] Army Staff General Ashfaq Parvez Kayani, termed these as very unfortunate and not based on facts. This is especially disturbing in view of a rather constructive meeting with Admiral Mullen in Spain. “On the specific question of contacts with Haqqanis, the COAS [Chief of Army Staff] said that Admiral Mullen knows full well which countries [not named here] are in contact with the Haqqanis. Singling out Pakistan is neither fair nor productive. “Pakistan will not take military action against the Haqqani Network, despite intense U.S. pressure over the past few days. The decision was taken at a special meeting of top commanders on Sunday [September 25] and is likely to chip away at the deteriorating relationship between the two countries. “The commanders vowed to resist U.S. demands for an offensive in North Waziristan but also discussed the possible implications of unilateral action by the U.S. on Pakistani territory, said a military official. ‘We have already conveyed to the U.S. that Pakistan cannot go beyond what it has already done,’ the official… [said]. “A public acknowledgement by the military’s chief spokesman about Pakistan having contact with the Haqqanis also appears to confirm that the [Pakistani] security establishment has no intention to go after one of the most feared Afghan insurgent groups. ‘Any intelligence agency would like to maintain contact with whatever opposition group, whatever terrorist organization… for some positive outcome,’ Major General Athar Abbas… [said]. 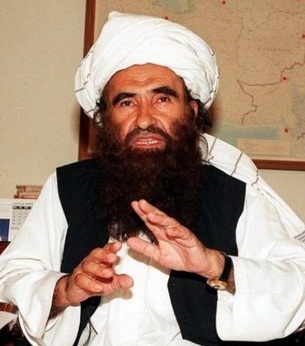 On September 23, 2011, Sirajuddin Haqqani, chief of the Haqqani Network, warned the U.S. against any likely military invasion of North Waziristan, which is also major hideout for Al-Qaeda and other Taliban organizations. On September 25, 2011, dozens of Islamic clerics in Pakistan held a meeting in the Pakistani city of Lahore, where they jointly issued a fatwa (Islamic decree), declaring that jihad will be mandatory on the entire Pakistani nation in the case of possible U.S. attack on the Pakistani soil. About 50 muftis (Islamic scholars qualified to declare fatwas) issued the decree at a Lahore meeting of the Sunni Ittehad Council (SIC) of Barelvi Sunni clerics in Pakistan. Leaders of about 50 religious organizations participated in the meeting. At the SIC emergency meeting chaired by Sahibzada Fazal Karim, the Barelvi clerics – who are opposed to the Deobandi-supported Taliban, also asked the Pakistani government to formally start preaching Jihad Fi Sabeel Allah (Jihad for the sake of Allah) in accordance with the rules of Islamic Sharia and take all necessary measures to defend the country’s sovereignty. Urging the political and military leadership of Pakistan to begin preparing for war against the U.S. in accordance with shari’a, which requires the Islamic governments of the time to prepare for combating enemy forces, the clerics urged all political forces to abandon their differences and gather on one platform under the banner of Islam to defend the country’s independence and sovereignty and to convey a message to the U.S. that the religious, political and military leaderships of Pakistan are united against any foreign aggression. The fatwa also urged all politicians, bureaucrats and military leaders to bring their assets in foreign banks back to Pakistan, and also expressed appreciation for the bold stand of Pakistan Army Chief Gen. Ashfaq Parvez Kayani against the U.S. allegations. www.tribune.com.pk (Pakistan), September 26, 2011. The Express Tribune (Pakistan), September 26, 2011.
 www.dawn.com (Pakistan), September 23, 2011.
 www.ispr.gov.pk (Pakistan), September 23, 2011. The Express Tribune (Pakistan), September 24, 2011. Roznama Ummat (Pakistan), September 26, 2011. BEFORE the September 11, 2001, attacks against the US, few outside the academic and intelligence communities were familiar with the name al-Qa’ida. A decade later, it pervades the collective psyche. Almost every university, news outlet, government agency and think tank now has an al-Qa’ida expert. But what have we learned about al-Qa’ida in the decade since the towers fell? WASHINGTON D.C: US President Barack Obama has ordered a revision of America’s National Security Strategy to remove terms that link Islam to terrorism, administration officials said. The officials said the change would remove terms like “Islamic radicalism” from the National Security Strategy, a document that was created by the previous administration to outline the Bush doctrine of pre-emptive war. The US National Security Strategy outlines major national security concerns and the methods to deal with them. Such documents are prepared periodically by the executive branch of the government for Congress. US media outlets often refer to this document for borrowing terms to use in a report. Obama Moves to De-link Terrorism from Islam – NAM. Blackwater’s Legal Woes Mount—By Scott Horton Harpers Magazine.